Many farmers in developing regions of the world have no low-cost way to reliably assess their stored grain for moisture levels. Too much moisture can lead to spoilage, insect infestation, and growth of molds like Aspergillus, which will often render grains unfit for consumption. A team of Agricultural Research Service (ARS) and Kansas State University (KSU) researchers has been addressing the problem over the past year – and helping subsistence farmers prevent postharvest grain losses of up to 30 percent in the process. In underdeveloped countries like Ghana, grains like corn are stored in large bags rather than in bins or silos like in the United States. ARS agricultural engineer Paul Armstrong and his KSU colleagues developed a hand-held device they hope will provide the farmers with a fast, low-cost way of checking their grain bags. “The meter works by measuring the relative humidity and temperature within the grain to estimate moisture content,” says Armstrong, who is with the ARS Center for Grain and Animal Health Research in Manhattan, Kansas. “It is a fairly old concept, but it can be made more practical with modern, inexpensive sensors,” he says. The device is known as the post-harvest loss (PHL) moisture meter, and it costs about $75 to make. It is designed so that it could be built by farmers, or someone assisting them, using off-the-shelf parts and without sophisticated manufacturing equipment or facilities. It features a probe that’s inserted directly into a bag of grain to check for moisture levels. Readings appear on a small display window on the device after about 6 minutes. “Determining whether the grain moisture is low enough before storage is critical to avoiding molds and reducing insect damage,” says James Campbell, who leads research at the Manhattan center’s Stored Product Insect and Engineering Research Unit, where Armstrong developed and initially tested the device. Armstrong got involved when KSU colleagues requested his help with a U.S Agency for International Development (USAID) project called “Feed the Future Innovation Lab for the Reduction of Post-Harvest Loss.” Its objectives include finding ways to reduce hunger, poverty, and malnutrition in impoverished countries. ARS also is a partner with USAID on its Feed the Future efforts to address world food security issues. As part of the project, the PHL moisture meter is being evaluated by grain farmers in Ethiopia, Guatemala, and Bangladesh, as well as at four sites in maize-producing regions of Ghana. 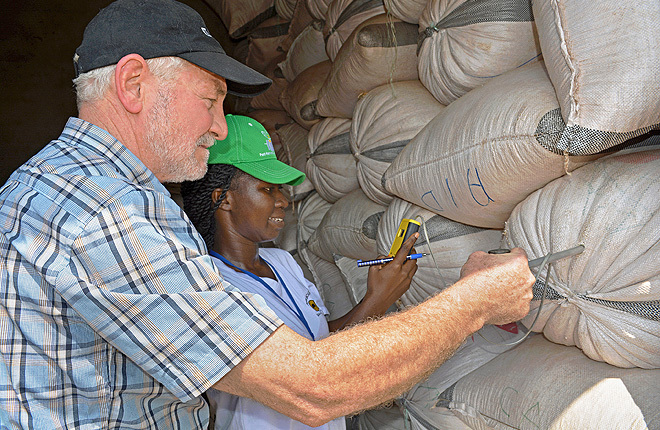 In the Ghana trials, the moisture meter performed well compared to two other devices commonly used in Western grain production systems that can cost a few hundred to a couple thousand dollars. A description of the device and trial results will be submitted for publication as a technical note in Applied Engineering in Agriculture. With feedback from farmers, Armstrong and his colleagues are making refinements, including extending battery life, shortening measurement times, adding smart phone connectivity, and reducing cost. Part of this effort is being funded through an ARS Innovation Fund grant.—By Jan Suszkiw, ARS Office of Communications. In developing countries, grains are often stored in bags, not silos. High moisture in stored grain can lead to mold growth. Current moisture tests can be costly and impractical for some farmers. ARS and university scientists made a simple, inexpensive moisture meter.